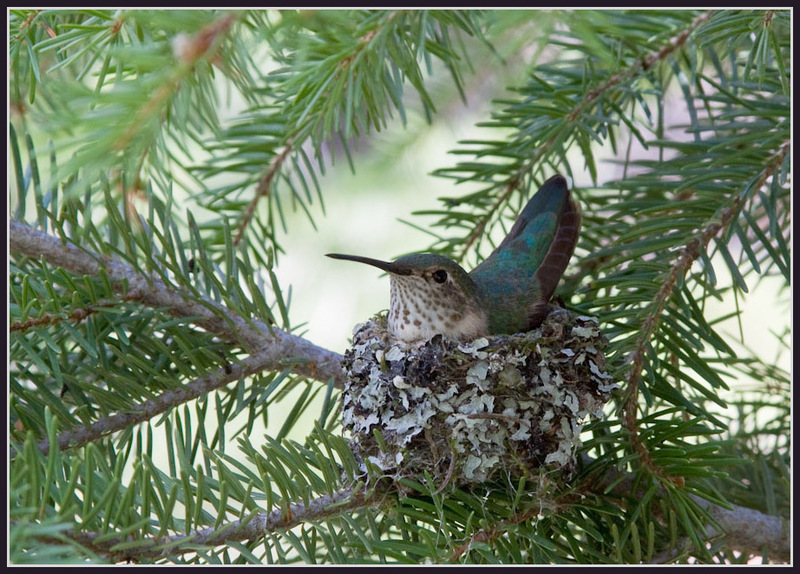 Female broad-tailed hummingbird on nest. Click for larger. Probably the most beautiful nest I’ve ever seen. She’s decorated it with pieces of lichen to make it more camouflaged. Click on the photo for the larger version and see the cobwebs she grabbed from the forest to glue the lichen to the nest. An amazing work of art. She seemed at ease with me being close. I actually had hoped she would fly away so I could see what is in the nest. I will have to hike back in a couple of weeks and check on things. I’ve never seen a Hummingbird’s nest before! How did you even spot it? And I can’t believe how close you got to take such a beautiful photo. The nest is beside a trail that I frequent and she kind of led me to the nest, which is the opposite of most birds. Most birds will lead a potential predator away from their nest, even feigning injury. I guess she didn’t think I was a threat. I didn’t have my camera on that first encounter so I memorized where it was. It’s about a 45 minute hike. The funny thing is I have a couple of hummingbird nests right outside my front door, but they are too high in the tree to see. My guess is that this is her second attempt at nesting this season; the first must have failed. Most build their nests in May and are fledging young in mid-July. I got to see a pair of hummingbird eggs and nestlings up close where I grew up – they built their nest low enough that we could peer right in. This one is only about 3 feet above the ground in a Douglas fir. Thank you! I hope there will be more great shots with this bird and her family in the future. Love this bird and her nest. There was a remarkable program on PBS about birds and their intelligence as well as their beauty .